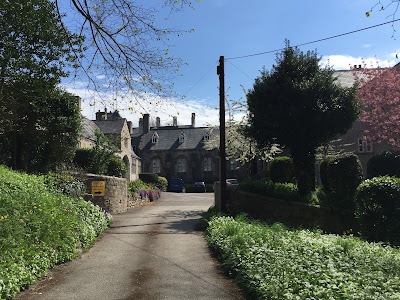 Having decided to take a couple of days of silence at a suitable and not-too-distant retreat centre of some kind or another, I trained and bussed to St Asaph, then walked the 3.3 miles to St Beuno's. Certain amount of leg-pulling at home about my private pilgrimage - you can imagine..."no, I won't have to get up at four in the morning for matins, or wear a long robe, it's not a monastery, or eat gruel at every meal..."
But although I didn't see myself as a pilgrim, it did feel quite special, a new experience, to be approaching such a place on foot. 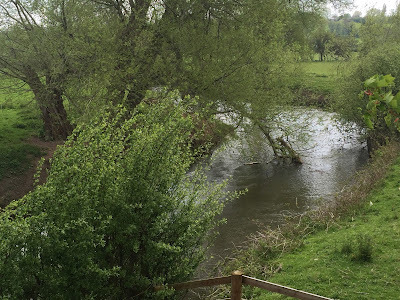 A pleasant walk at first; idyllic moments gazing at Afon Clwyd. The picture is deceptive. A few yards further on, over the river, and what's this ahead? The A55. From the footbridge over it, the blast of noise, the pressure of the speed, is almost overwhelming. Well, that's quite enough of that. If you've ever been stuck on the hard shoulder, (bad luck - so dangerous!) you'll know what I mean. I'd rather listen to that river. But there's no point in being self-righteous about this. 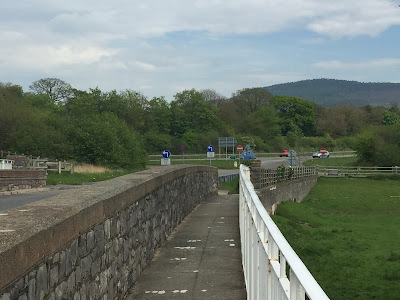 I might be en route to a couple of simple and tranquil days' living, I might feel virtuous because I'm walking the last bit, but I've driven at 80 mph along this road myself, many a time. And being close to this horrible racket is a useful experience - makes me remember that it really is worth trying to drive as infrequently as possible. So what the A55 says to me is "keep off me as often as you can." It hardly seems possible that this corridor of noise and tension should co-exist with that peaceful little river. The impact on its surroundings of a fast road like this is so much more than omnipresent noise for many many yards all around. It's a huge slice of the land, slicing through whatever continuities existed previously. It's all that exhaust gas. Perhaps the only upside is that motorway verges act as longitudinal nature reserves, and corriders for species distribution. Kestrels like to hunt them. This road doesn't even have proper motorway-type verges. It was a motorway on the cheap, dangerous and in places not well engineered. But it is an E route to and from Ireland. Everything on it is in a big hurry. I pass through a very settled comfortable-looking little village, under the A55, and then I'm very pleased to be hauling myself wearily up the drive to St Beuno's. Is Zen a religion? If so or not so, so... what?